Is there treasure buried beneath this craggy Nova Scotia isle? Welcome, treasure hunters, to Oak Island, and the deadly mystery of the Oak Island Money Pit. The story begins in 1795 when young Daniel McGinnis witnessed eerie lights emanating from the tiny island in Mahone Bay. Upon visiting the next day, McGinnis discovered a circular depression at the island’s southeastern end, along with freshly cut trees and what appeared to be a pulley system constructed over the soft ground. Rallying his friends, McGinnis and Co. began digging. Just two feet in, their shovels struck flagstone laid across the mouth of the depression. Further down, they uncovered deep pickaxe gouges along the wall of the pit and a layer of timber embedded in clay. Convinced they stood over a very valuable secret, the boys removed the logs – they were met with more dirt. Ten feet down, they uncovered a second timber shelf; ten feet below that, yet another layer. At 30 feet deep, they stopped their excavation. The history of Nova Scotia is remarkably rich with pirate folklore. According to the Maritime Museum of the Atlantic in Halifax, pirates routinely visited the region, attracted to its hidden coves and large swaths of unsettled land. The notorious Captain Kidd claimed to have hidden treasure in the area, as did pirate Ned Low. No wonder, then, that McGinnis kept digging. No wonder that even after he and his buddies abandoned their search, the legend of Oak Island refused to die. In 1804, a new group arrived intent on unearthing millions. Dubbed the Onslow Company, the team picked up right where McGinnis left off. And just like McGinnis, they struck upon shelves of timber evenly buried every ten feet. Records indicate that at the 60-foot mark they found coconut fibers scattered among the Canadian logs. At 90 feet down, the men made an astonishing discovery: a giant slab of stone, covered in mysterious writing. The pit wall, meanwhile, ruptured soon after the Onslow Company discovered the slab. Water poured into the pit, flooding it beneath 60 feet of water. Numerous attempts to bail the pit proved futile. It was as if the area were rigged to fill with water. In 1805, the Onslow Company called it a day. And yet the flooding did nothing to calm hungry treasure hunters. If anything, it intensified their drive. No longer were they hunting for a haversack of loose change or a few pilfered candelabras. Believers were convinced the underground contraption was the work of a highly skilled individual who had gone to extraordinary lengths to hide his fortune somewhere beneath Oak Island. The year 1849 saw the arrival of the Truro Company, and the beginning of a long and troubled history filled with discoveries and bloody demises. 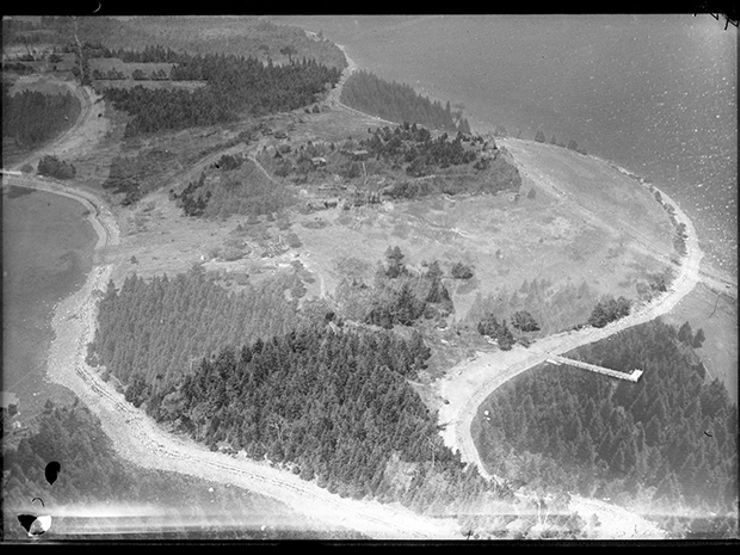 In 1861, an excavation by the Oak Island Association caused the total collapse of the pit floor into either a natural cavern or a booby trap beneath. Oak Island also claimed its first victim that year, when a pumping engine burst and killed a man. In 1887, a second worker slipped from the rim of the pit and fell to his death. In 1909, a group of intrepid treasure hunters arrived on the island, including a young Franklin Roosevelt. While they found no treasure, Roosevelt followed the Money Pit mystery for the rest of his life. In 1931, numerous tools were unearthed within a new shaft. The discovery included a miner’s pick, a hatchet, and remnants of a seal oil lamp. Unfortunately, the island had been so completely ravaged by excavations and littered with old tools that it was hard to accurately date the discoveries. And yet, to this day, no treasure has been found. Critics contend the site is a sinkhole and its mystery blown vastly out of proportion. But a string of incredible theories have surfaced to explain the pit’s origins: It contains Marie Antoinette’s jewels; it’s a ritual site built by Freemasons; it’s the handiwork of Francis Bacon, who used Oak Island to stow away proof that he is the true scribe behind the works of William Shakespeare. In 2014, the History Channel debuted The Curse of Oak Island, a documentary series detailing a new excavation and the island’s enduring legacy. In the season one finale, workers discover what appears to be an antique Spanish coin. The program recently wrapped up its fourth season. Clearly, the Money Pit mystery is not over just yet. This requires further investigation. Sign up for The Archive's free newsletter and dive deeper into the world's greatest mysteries.